Time has been short this holiday weekend just ending, so I haven't had a lot of time to compose much for this week's tracks. Suffice it to say that I'm offering up two sides by Rodd Keith. 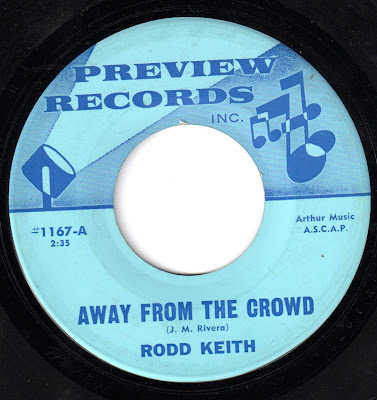 The A-side, "Away from the Crowd", is a bit of supper club pop, complete with a horn section, and is remarkable for it's length - over 3 1/2 minutes - rare for a song-poem single, and a minute more than the time listed on the 45. The flip side is "Be Wise". And that's always a good idea. Today, something very special, a song-poem acetate demonstration disk. I picked up a handful of these recently, most of them featuring Cara Stewart and containing multiple other clues as to their song-poem origins. This one, however, is more of a mystery. Like most acetates, I'm sure it was produced in very small numbers. 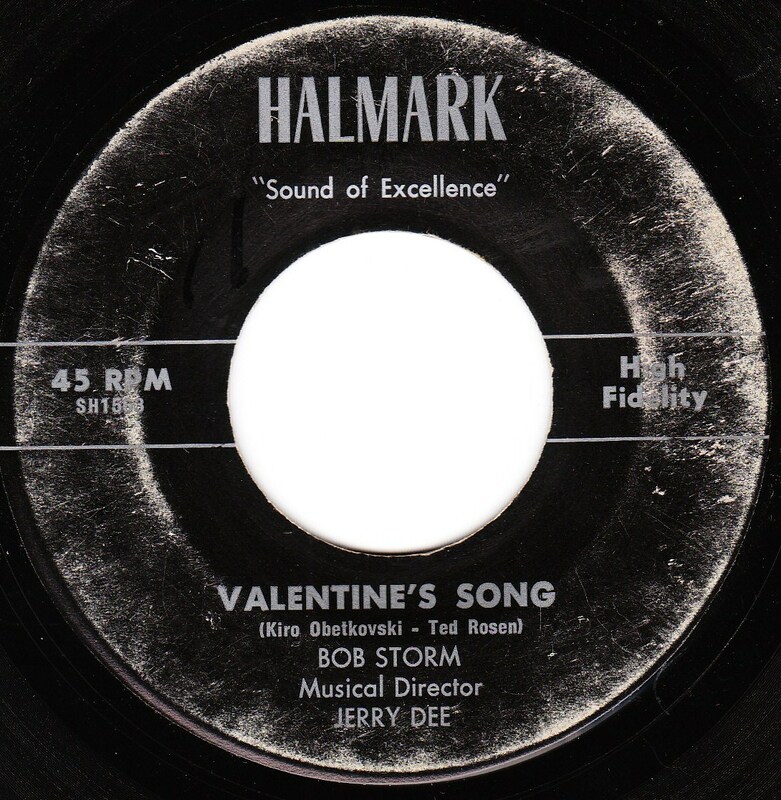 In fact, this may be a one-of-a-kind record. 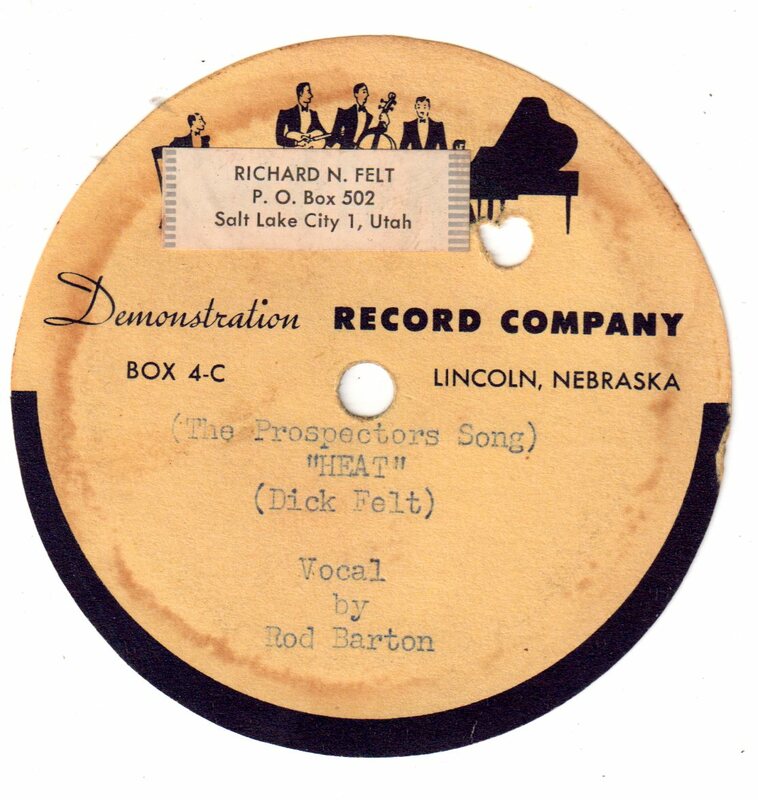 The songwriter has placed a sticker with his information over part of the name of the recording service, which I don't really want to remove, but which might be covering up the only clue as to the song-poem factory which produced the record. The two clear pieces of evidence that this is a song poem record come from the fact that the performer is Rod Barton, a singer whose work shows up on several of the smaller song-poem labels, and the fact that the record came with sheet music of the song. 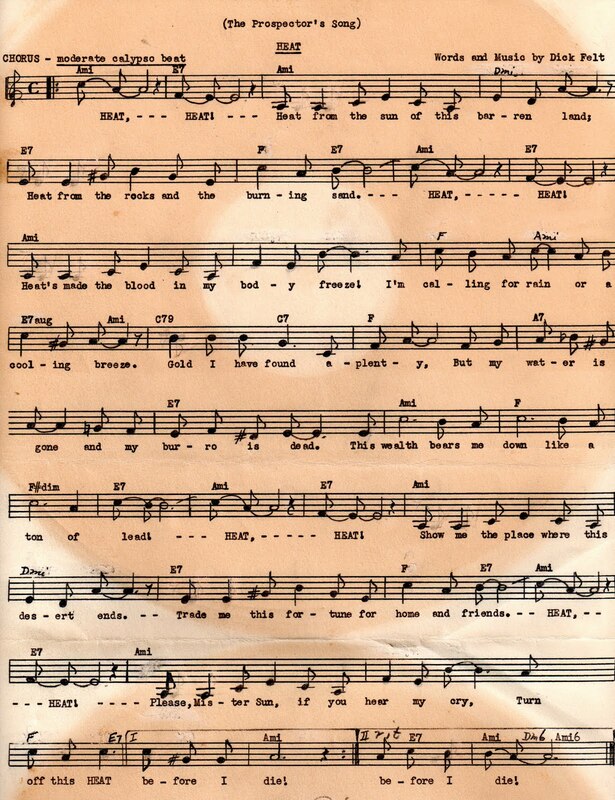 The song itself is titled "Heat (The Prospector's Song)", and here's that sheet music, followed by the track itself. The flip side is not labeled in any way, and someone clearly didn't want it to be mistaken for the "hit" side, as that person has drawn several large marks across the playing surface in some sort of crayon, oil marker or something similar. 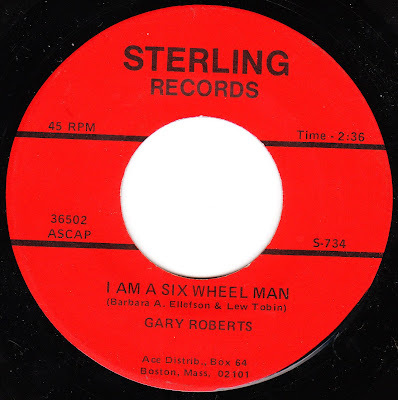 I believe this is also Rod Barton, singing a cappella, although the title is not clear. Way back in 2001, when the release of the various song-poem CD's had still be fairly recent, songs were being posted to the ASPMA website on a regular basis, and more CD's were but a few years away, I asked one of the main guys behind those releases if he knew what the most popular song, out of all of those which had been released. He didn't hesitate for a moment; it was not a close call. The answer was "Do You Know the Difference Between Big Wood and Brush", by Gary Roberts. Indeed, the "greatest hits" compilation would later be named after this song. 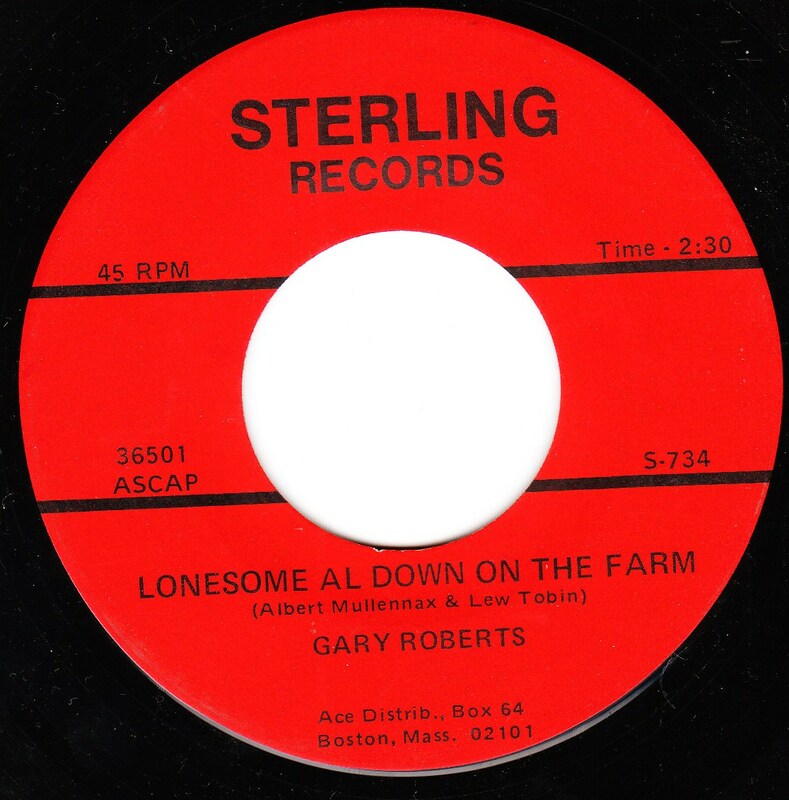 With that in mind, I was surprised to realize that I've never featured a Gary Roberts song here. I guess it's not that unexpected - compared with many of the other song-poem stalwarts, he didn't make all that many records, and I have only a relative few of those. On the other hand, the percentage of his records that score high on the weirdness scale is remarkable. Here's a good one that might just make your mouth drop open. How could it not be special with a title like "Lonesome Al Down on the Farm". 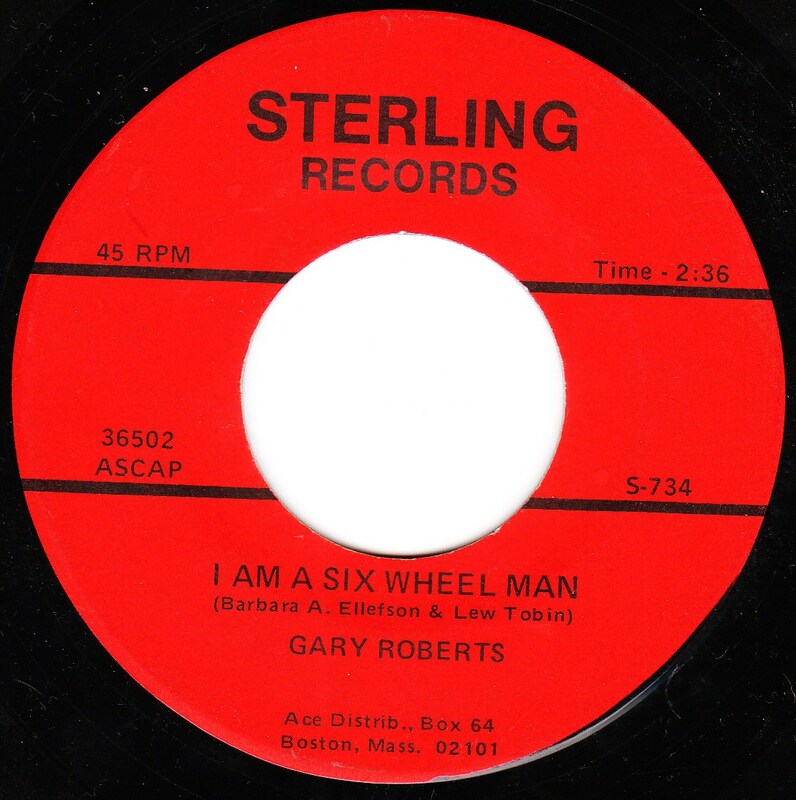 On the other side is the equally amazing "I Am a Six Wheel Man". The words come fast and furious here, and maybe it's just me, but I've listened to this several times without quite being able to follow the convoluted storytelling. The end of the story, in particular, seems grafted on and completely out-of-left-field. 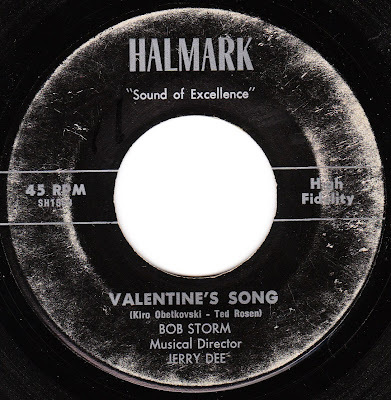 I thought we were overdue for a little Halmark label music. Here's a typically stultifying track, with lyrics by the wonderfully named Kiro Obelkovski. 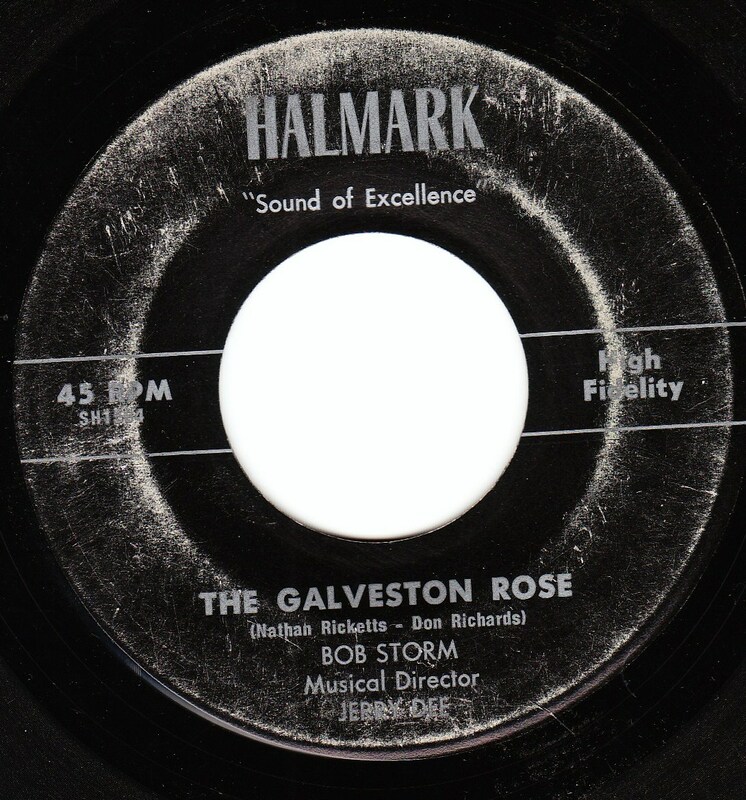 The vocalist is identified as Bob Storm, but he's joined here by an unnamed over-emotive female vocalist, most likely Dodie Frost, although I can't say that for certain. This is the first time I've featured the "Ronnie" label, and the reason for its absence until now is that the records released on this label are almost uniformly uninteresting. Not car crash bad or hysterically bad, or compelling in some other way. Just dull. This EP features the one exception, in my view. 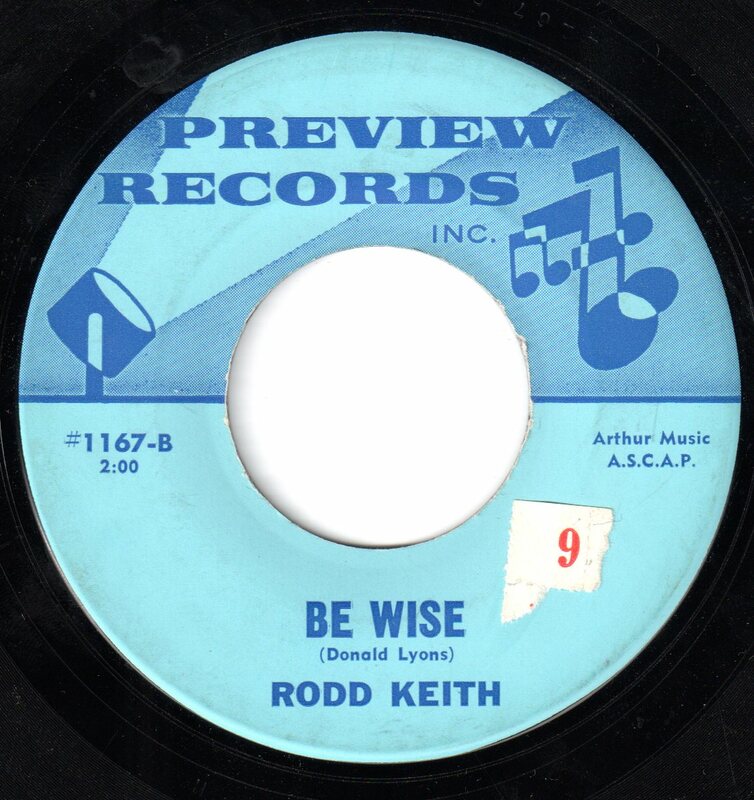 I excerpted the best song from this batch at WFMU when I first announced this project, but it's heard here with better sound quality, and surrounded by the other songs from the EP. 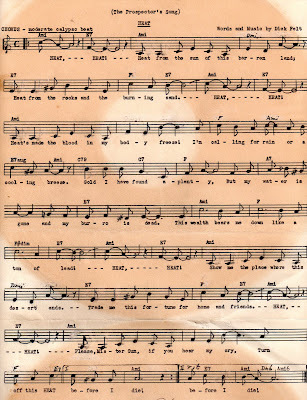 The A side features Sammy Marshall, using (appropriately) his blandest pseudonym, "Ben Tate". 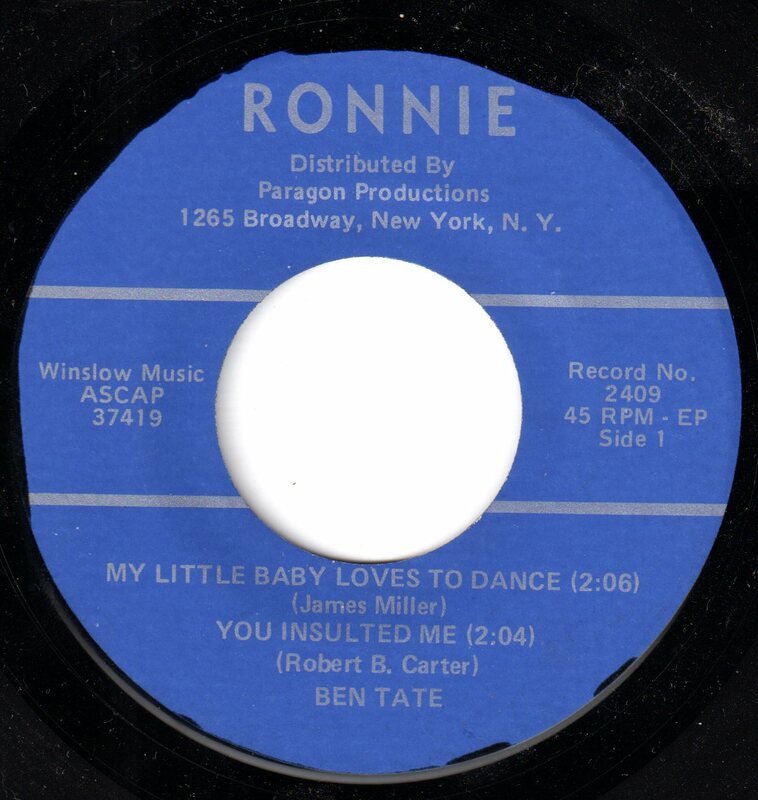 The first track on this side is humorous in that Sammy is heard discussing his baby's love of dancing to rock and roll, and yet, if that's the case, there's no chance she'd be dancing to this song! This song joins a long list of song-poem records about rock and roll whose settings have nothing in common with the genre. The real winner here is Mr. Tate's second song, "You Insulted Me". The over-the-top reaction of this writer to... whatever the insult was, never fails to get a grin out of me and has tended to startle listeners who are new to the song. We quickly go from a bit of hurt and outrage to assumptions of complete (and aggressive) non-interest on the part of his target. 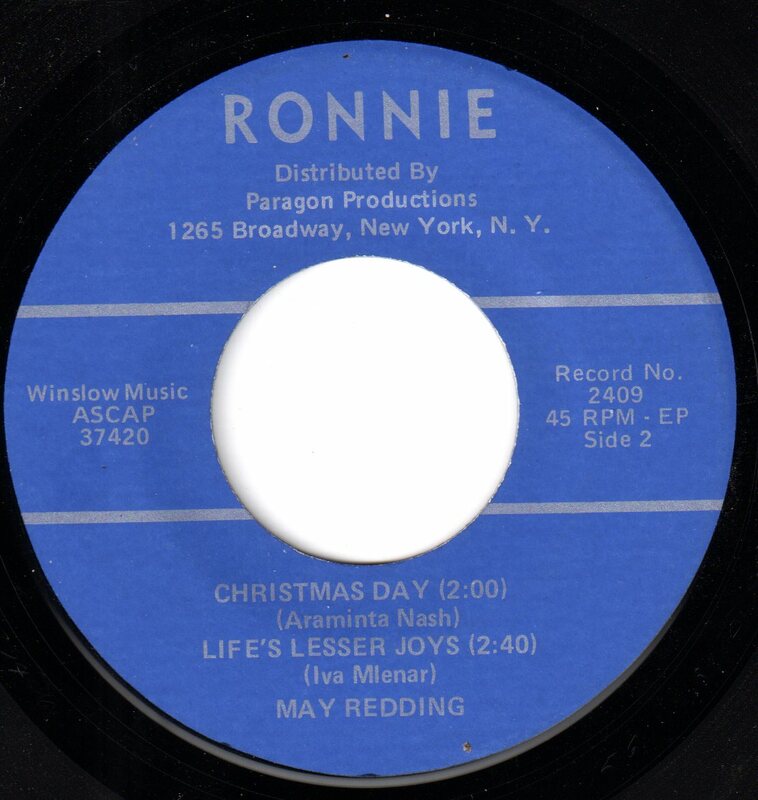 Two less-than-interesting songs by someone named "May Redding" round out the EP. 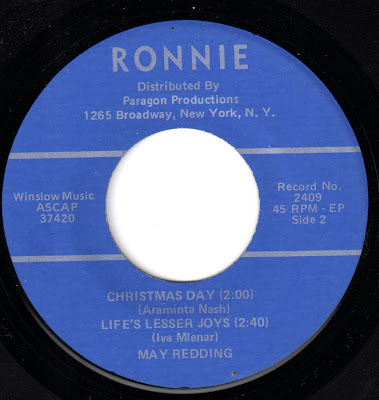 On "Christmas Day", it's a bit fun to listen for the sax player fitting in little pieces of "Jingle Bells" between the verses, a peculiar choice for a lyric which is focused on the religious aspects of the holiday. 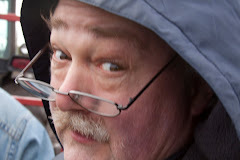 Finally, a shout out to my father, Frank Purse, who left us on this date, May 3rd, back in 1996. We all miss you, dad.